Recently Spyrys, a 10 year old 46 foot, went on a Mediterranean voyage from Croatia towards her new home in Venice. 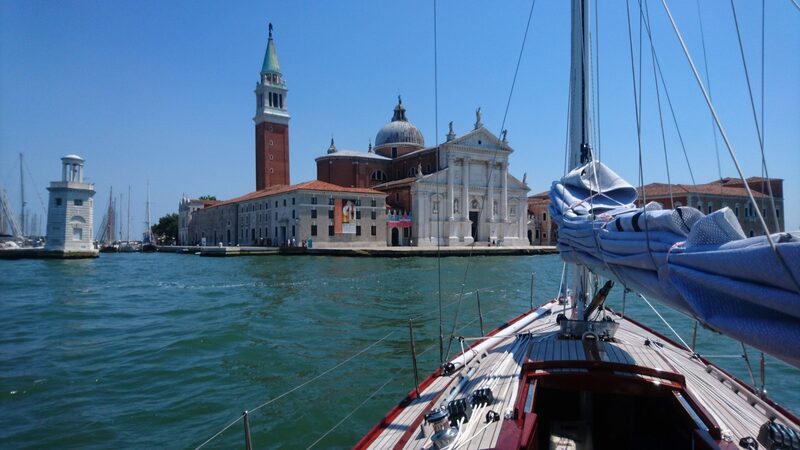 We asked trusted Professional Yacht Deliveries (PYD) to undertake the trip and enjoy a brief taste of the James Bond life by sailing into Venice as Daniel Crag and Eva Green did in Casino Royale. “With an experienced crew, and many high profile yacht deliveries under our belts, you could argue that each delivery is just another job, but having the opportunity to sail a Spirit is always a privilege. “We began our adventure in Croatia, in the fascinating town of Split. Spyrys arrived aboard a cargo ship safely into Split Docks early in the morning. Once in the water, she soon began attracting attention and not for the first time that journey she had many admirers photographing her. “As we slipped our lines and cast off beside the cargo ship, work stopped on board for the ship’s crew as they took time to watch us cast off. “Soon after leaving Split we hoisted the sails. Wind was not forecast for the trip so we made use of the fresh breeze while we had the chance. Once we had popped a quick reef in the main, we sailed at a happy 10 knots all the way around to the main harbour. Spyrys effortless performance on and off the wind was undeniable and aside from a brief interruption to retrieve a mates cap, we enjoyed a smooth first sail. “Our next port of call was to refuel at the main harbour so that we were prepared for the trip ahead. We met the owners of a large motor yacht, who admired Spyrys resemblance to the James Bond yacht and were thrilled when we confirmed she was a Spirit Yacht of the same design. Our chat led to the kind offer of fresh water to fill our tanks and wash the decks ahead of our journey. 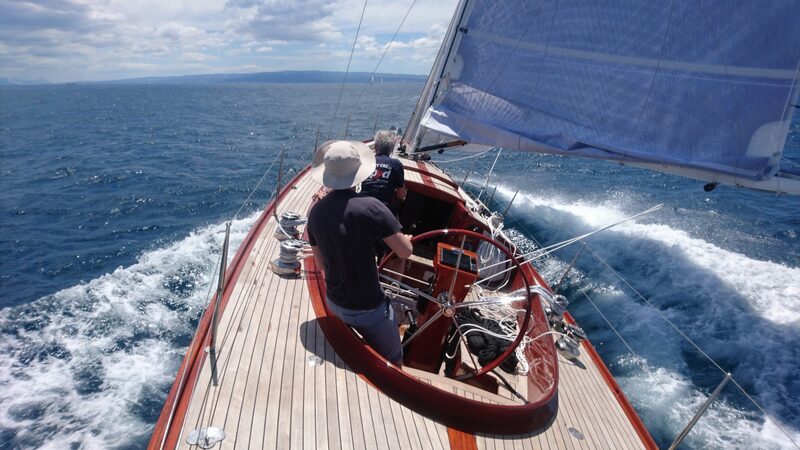 “Once leaving Split, Spyrys sailed beautifully. Whether reefed or under full sail, she went windward like a dream. We left mid-afternoon in wind that was gusting low to mid 20s. However, once reefing the main and jib we sailed comfortably with the north north-easterly wind keeping us nicely on track. The wind continued until the early hours of the morning before slowly dying off, leaving us to turn to the engine. Despite this, at 2000 revs we maintained a good speed at around 5 knots which increased to 6-7 with assistance from the wind. “As Monday morning broke, our hopes were high as the wind got up again. We enjoyed a morning of steady wind but it didn’t last long, and as the day went on the wind came round to the northwest, just where we didn’t want to be. The wind was not in our favour but we wouldn’t let this take hold. We sailed on, tacking and tweaking the course in order to get the best balance between boat speed and heading, while keeping an eye on the charts as we avoided many oil rigs and shipping lanes in the area. Of course, with an 80 litre fuel tank we could have used the engine, but we didn’t want to miss out on a chance for some exciting sailing, so decided we’d keep the fuel only for the calm forecast and manoeuvring into Venice. “Enjoying the warm sunshine and good wind, we powered along until we were eventually forced to give up on the wind. As forecast, the wind died away completely which let us savour the moment as we watched the sun rise over a glassy sea. With conditions remaining the same, we motored the rest of the way, reaching the Venetian island of San Giorgio Maggiore early on Tuesday afternoon clocking in at 44 hours for the trip. “We were welcomed with admirers even before we even entered the lagoon. A beautiful classic boat, not too dissimilar to ourselves, sailed over to us with many waves and ‘che bellas’ from her crew as we approached the fairway buoy. Our destination marina was directly opposite Piazza San Marco, in the shade of the iconic San Giorgio Maggiore tower. As we entered, the ‘marinara’ who came to help us with berthing was delighted to have Spyrys as an ornament in his dock as he was practically stroking her hull as we docked. Before long the crowds where gathering, commenting ‘bellissima barca’ or ‘beautiful boat’!